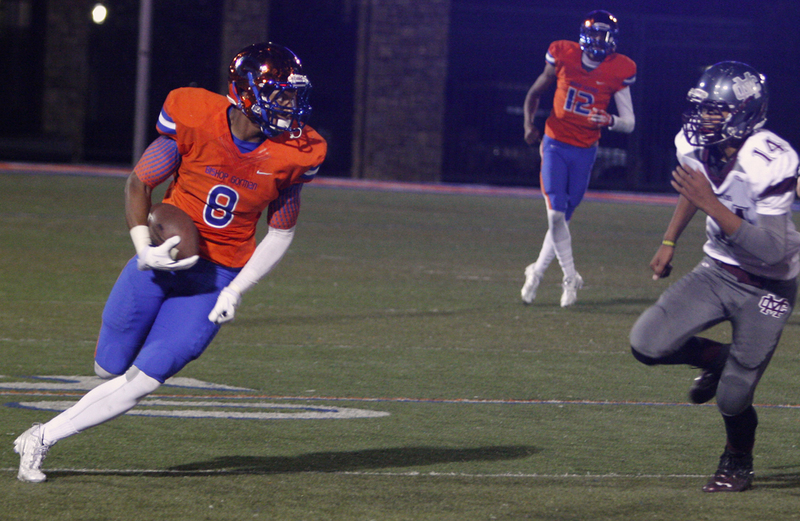 Bishop Gorman’s Alize Jones, regarded by some scouting services as the nation’s No. 1 tight end prospect, announced on Twitter on Thursday morning that he is headed to Notre Dame. The 6-foot-5, 230-pounder had 41 receptions for 930 yards and 13 touchdowns while helping lead the Gaels to a 15-0 record and No. 1 national ranking by USA Today. He had previously verbally committed to UCLA where his uncle, former major league star Shane Mack, played baseball. But Jones took a recruiting visit to South Bend on Dec. 13 along with Gorman safety Nicco Fertitta, who had earlier verbally committed to the Fighting Irish. Jones then tweet a picture with himself and Fertitta walking on the field with two Notre Dame players with the headine, “Bishop Gorman to Notre Dame … The future is bright.” He also updated his twitter profile to say he is committed to Notre Dame. The addition of Jones means that three players from Bishop Gorman will play at Notre Dame next season. Another former Gael, left tackle Ronnie Stanley, recently announced he would return for his senior season despite being rated a potential first round NFL pick this spring.